Abby the Librarian: Author Interview: Fiona Bayrock! I am so pleased to post an interview with Fiona Bayrock as part of her blog tour! 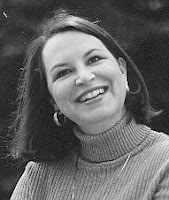 Fiona Bayrock is the author of many books for kids, including the recently released Bubble Homes and Fish Farts, which has garnered many rave reviews! Fiona was also the organizer for the 2008 Cybils Non-Fiction Picture Book category. 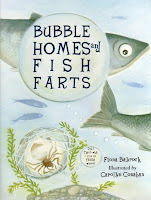 If you haven't picked up Bubble Homes and Fish Farts, I don't know what you're waiting for. It's an excellent nonfiction book about the many interesting and unusual ways that animals use bubbles. From comunication to protection to just plain fun, animals use bubbles in lots of weird and fantastic ways! Abby: I had no idea that there were so many animals that used bubbles in so many different ways! Fiona: Neither did I! It was a delightful surprise. How did you come up with the idea to write about animals that use bubbles? Finding clippings about the dolphin bubble rings and spider bubble homes in my idea file got me thinking about the spittlebugs in my garden and recent science news of the fish fart discovery. Here were four very different animals using bubbles in very different ways. I thought it would be a great idea for a book, but I needed many more examples. After a little preliminary research, I had a long enough list to go ahead, and that was that. Can you tell us a little about your research for this book? Did you have all these animals in mind when you started or did you discover some along the way? I wrote most of the book under contract, so I needed a complete list of animals in order to submit the proposal to the publisher. However, the list was based on preliminary research, and once I got into the real research a few things changed. The violet sea snail and water shrew turned up during the research process. Finding hidden gems like that is always exciting. And the star-nosed mole was a last minute addition, as scientists discovered the secrets of its bubble use only after the final manuscript had been accepted, gone through several rounds of editing, and was ready to go to the illustrator. It was a kind of "Stop the Presses! We have to include this!" moment. Sometimes preliminary research will show something that with further research you discover to be false. That was how the American alligator made it into the original proposal, but not the book. I had included it based on scientific papers by a pair of scientists who had reported seeing alligators blow bubbles as part of their mating ritual. But when I tried to find other sources to corroborate this, I couldn't find any support for it. None. Not even a hint. I eventually contacted an alligator biologist. In the thousands of alligator matings he had observed (Really! What a job, eh?) he'd never seen them blow bubbles before, during, or after mating. With no corroboration, and a good case against, the alligators had to go. Did your research take you to any interesting places? The internet allows me to go wherever the experts are. For this book, I talked to scientists in Australia, The Netherlands, England, and all over North America, from Texas to Alaska and British Columbia to Virginia. As luck would have it, one of the key scientists studying humpback whales and herring teaches at a university near me, so he and I spent an afternoon together on campus. I also toured the fish labs at the nearby Vancouver Aquarium, where I interviewed scientists about gourami breeding, dolphins, and beluga whales. If you had to choose one of the animals in BUBBLE HOMES to be for a day, which one would it be and why? LOL! Hmm...I think I'd like to be the dolphin. Playing with those bubble rings looks like an awful lot of fun! I began by writing articles for kids' science magazines such as Odyssey, YES Mag, and WILD, then I moved into writing books for the educational and subscription markets. Now I write mostly trade books, some poetry, and the odd article here and there. On your website, you mention that you've talked to scientists all over the world. Who's the most interesting person you've talked to and what did you talk about? They're all interesting. And I'm not just saying that to be diplomatic. It's true. Each one has followed his or her passion, asked questions, and then devoted years to seeking the answers, often in very creative ways. When people talk about what is meaningful to them, the passion resonates and the subject is vibrant. I love being a part of that, whether I'm listening to the lead scientist on the Beagle Mission to Mars or the biologist who proved a simple relationship between two textures on the back of a tiny beetle no one's ever heard of. You've served on Cybils panels, so I know you've read tons of non-fiction kids' books. What are a few of your favorites? You are so right! But oh, that's such a hard question to answer because I know I'll miss a bunch. I'll just say I adored the Cybils winners the two years I served on panels: Nic Bishop Frogs by Nic Bishop, and Lightship by Brian Floca. That should keep me out of trouble.